Before the advent of lab tests, X-rays, MRIs, and other modern diagnostic tools, the patient history provided the surest path to diagnosis. Turns out the patient history remains the gold standard for care, responsible for upward of 80% of diagnoses, according to Improving Diagnosis in Health Care. In the emergency department (ED), where patients include those suffering from dementia and other mental illnesses, the elderly, and frequent flyers who may be seeking drugs, the patient history can be time consuming and difficult to obtain. That time not only delays patient care but also affects the hospital's bottom line. The ED is a critical source of revenue and profit, responsible for 50% of overall admissions and an average 21.8% profit margin, according to a survey published in Health Affairs. In fact, 45% of a hospital's total revenue is derived from the ED in some fashion. Time spent tracking down critical information that isn't contained in the latest iteration of the EMR is time spent away from diagnosing patients, transferring others to inpatient beds, and treating those in the waiting area. An independent clinical archive (ICA) can help physicians compile the information they seek, allowing them to quickly diagnose patients to speed the care process and make way for the next case. An ICA, sometimes referred to as a next-generation vendor-neutral archive, provides a single repository for structured and unstructured data, including imaging studies, scanned patient documents, and other types of data. Study findings reported in the Emergency Medicine Journal found that 25% of patients aged 75 and older presenting in the ED could provide no medical history. Among those for whom complete data could be compiled, only a handful of patients could provide that information themselves, leaving physicians to consult relatives or the patient's primary care provider. Obtaining information from patients themselves took approximately seven minutes. When it was necessary to involve family, that time swelled to nearly 27 minutes. Consulting outside caregivers more than doubled the information-gathering time to nearly an hour. The Journal of the American Medical Association reports that 40% of ambulatory malpractice claims are attributed to diagnostic errors, with an average claim of $300,000. Mix in an impaired patient with an emergent condition, an uncertain medical history, potential comorbidities, and possible drug interactions, and the perils faced by ED physicians become even more acute. Then add in frequent flyers who try to fool physicians into prescribing unnecessary drugs. In both scenarios, physicians need the necessary information to make an accurate diagnosis as quickly as possible. This approach benefits not only patients but also hospital financials. 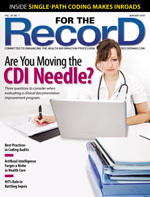 For more than a decade, EMRs have been hailed as the cure-all to medical recordkeeping, but its limitations become clearer with each new iteration. Over time, most health systems have used multiple EMRs. However, rarely do the data contained in the original make their way into the next iteration—much less the third. In fact, it is estimated that less than one-half of data actually move over during an EMR migration. Summary patient information (medications and allergies) may transfer, as may the last six months to a year of more complete patient information. As for the remainder, EMR vendors typically want to move as little data as possible. The information not part of an EMR migration is still around somewhere, but it's not readily available as part of the current patient record. To access these data, physicians have to log in to another system (if they can remember the little-used password) or consult with others. Even when missing data are found, they're often not in a format recognized by the EMR, leading to extra time being spent to translate or print the information. Besides improving quality of care and hospital finances, speedy and accurate diagnoses can increase throughput and cost avoidance by placing patients in the correct care setting as soon as possible. In addition, timely and efficient diagnoses allow hospital staff to treat more patients without additional staff. A 12-month study reported in Academic Emergency Medicine concluded that moving appropriate ED patients to inpatient floors within two hours allows a hospital to treat an additional 3,200 patients per year in the same treatment space, resulting in approximately $4 million in net hospital revenue. But when physicians struggle to find the necessary information among EMRs to make a diagnosis, the care process breaks down. According to a study in Applied Clinical Informatics, "The greatest risk of multiple EMR use is the risk of missing data and any corresponding decision support that impacts patient safety." EMRs are designed to quickly access patient information, but other benefits such as improved communications and drug interaction monitoring may be more difficult in settings with multiple nonintegrated EMRs. "A secondary but significant risk encompasses increased practitioner time requirement for both patient care and for training, which results in loss of income and in provider dissatisfaction with the EMR," according to the Applied Clinical Informatics study. Instead of maintaining multiple EMRs or other legacy systems—as well as keeping licensing and maintenance needs up to date—an ICA can become the central repository for archived patient information. An ICA is a standard-based repository for all manner of patient data from across clinical departments and applications such as DICOM images, HL7 broadcasts, XDS files, and other unstructured data. When patient data are ingested according to open health care data standards, the ICA captures a range of metadata for each stored item, enabling quick and easy discovery and retrieval of information. Direct integration between the EMR and the ICA offers clinicians and support staff a broader, richer patient record, sometimes referred to as a 360-degree patient view, all from a single entry point: the EMR. In addition, computerized sourcing and aggregating patient records across clinical applications and care delivery locations can reduce per-patient wait times, freeing staff to treat additional patients. Regarded as the Father of Modern Medicine, William Osler, MD, a founding professor of Johns Hopkins Hospital, died nearly a century ago, but his simple mantra to his medical students continues to resonate today: "Just listen to your patient; he is telling you the diagnosis." An ICA, in conjunction with an EMR, can help patients "speak" even when they may be unable to, accelerating the timeframe for medical decision making and treatment. — Jamie Clifton is vice president of product management and solutions for BridgeHead Software.